Wearing ordinary make-up when you are on the beach is not recommended, unless you want to look like the Bride of Dracula after a swim. However, cosmetics companies have launched excellent stay-put mascara formulas and water-resistant (not waterproof) eyeshadows. Some have even come up with waterproof and sand-proof hair gel, which seem very imaginative from a marketing point of view. Although wearing waterproof mascara on lashes and brows (choose the palest shade you can find for brows) is worth doing, the remaining contents of your make-up bag are best left for the evening. 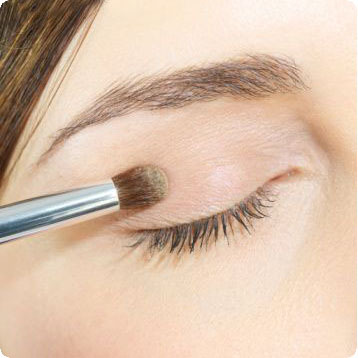 Foundation does not offer enough protection for strong ultraviolet light. Even if the product claims an SPF15 protection, you are unlikely to put it on thickly enough to cover the skin completely. Likewise, blusher that claims to offer sun protection will do next to nothing, unless you wear it all over your face. However, if you are not intent on sunbathing and do want to wear some colour on your face, use a tinted moisturizer that contains sunscreen. Unless your skin is chalk-dry, choose an oil-free formula. Many clever new tinted moisturizers contain microsponges, which help absorb excess oil. An oil-free water-based sheer foundation is another alternative. Once it is applied to the skin, the water in the formula evaporates, giving an instant cooling sensation and leaving the skin shine-free. If you must wear lip colour on the beach, choose a non-transfer formulas is that they tend to be drying, but slicking some ultraviolet-screening lip balm over the colour will remedy this. A less long-lasting choice is a natural coloured lip gloss that also offers sun protection. This entry was posted in advice, beauty, Free, look, make up, tips and tricks and tagged daytime, lashes, lip colour, make up, mascara. Bookmark the permalink. I’ve been exploring for a bit for any high-quality articles or weblog posts in this kind of space . Exploring in Yahoo I at last stumbled upon this site. Reading this info So i am happy to express that I’ve an incredibly good uncanny feeling I discovered exactly what I needed. I so much definitely will make sure to don?t put out of your mind this web site and provides it a look on a continuing basis. I was wondering if you ever considered changing the structure of your blog? Youve got an awful lot of text for only having one or 2 pictures for small hotels. This website can be a walk-by for all the data you wished about this and didn’t know who to ask. Glimpse here, and you’ll undoubtedly discover it. It will be good to surely see a website wherever the blogger understands truly properly in regards to the interests. We stumbled around listed here coming from the different website and assumed I would possibly examine elements out. I like what I see so i am just subsequent you. Glimpse forward to shopping above your net web page still all over again. Hello There. I discovered your weblog using msn. That is a really well written article. I will be sure to bookmark it and return to read extra of your useful info. Thank you for the post. I will certainly return. Recently i stumbled on your website and possess been reading alongside. I assumed I’d personally give my initially review Daytime Make-up | WS-Studio. I don’t determine what to say with the exception that We have taken pleasure in browsing. Well put together web-site serial key. Let me keep browsing your blog usually. Appreciate your showing. Keep posting such as this. The concept is just not actually new, but I certainly like that post. I discovered your blogging site through website catalog. I assumed I would verify out the article as I just wrote on this topic at this time. You include some great suggestions that I failed to have. Many thanks to the points. It’s a really good read in my opinion, Have to acknowledge that you really are among the perfect writers We actually noticed.Appreciate your publishing this interesting article. Aw, this was a really nice post. In thought I would like to put in writing like this moreover – taking time and actual effort to make an excellent article… but what can I say… I procrastinate alot and certainly not seem to get one thing done. This is the proper weblog for anybody who wants to find out about this topic. You notice so much its virtually exhausting to argue with you (not that I truly would want…HaHa). You definitely put a new spin on a subject thats been written about for years. Nice stuff, just nice! We be aware such as Im constantly searching through cause associated with welcoming things to pore more than near by a number of topics, however i be successful to include your own set up among my personal reads every life time because you provide delivery to persuasive records which i appear on in order to. I’d need to check with you here. Which isn’t something I often do! I take pleasure in studying a post that will make folks think. Additionally, thanks for allowing me to comment! I wanted to write you this little observation just to give many thanks once again with your splendid concepts you’ve shared above. It has been really surprisingly open-handed with you to present easily what exactly a lot of folks would have offered for sale as an ebook to end up making some profit for their own end, certainly seeing that you might well have tried it in case you considered necessary. These suggestions also acted like a great way to be aware that someone else have the identical zeal similar to my own to figure out good deal more in regard to this matter. I am certain there are many more fun times up front for individuals that read your website. This is the best weblog for anyone who wants to search out out about this topic. You realize so much its almost hard to argue with you (not that I really would need…HaHa). You undoubtedly put a new spin on a subject thats been written about for years. Great stuff, simply great! you’ve got an excellent weblog right here! would you wish to make some invite posts on my blog? I could go on and on about how great your article is, but I’d rather tell you I appreciate your dedication to writing quality content. It’s seldom I see writers care this much. Thank you. Perfect material! I have been previously searching for something similar to this for a long time now. Thank you! ss2s44 Very neat blog article.Really looking forward to read more. Hello there! I know this is kinda off topic however , I’d figured I’d ask. Would you be interested in exchanging links or maybe guest writing a blog article or vice-versa? My site addresses a lot of the same topics as yours and I feel we could greatly benefit from each other. If you’re interested feel free to send me an email. I look forward to hearing from you! Superb blog by the way! Howdy would you mind stating which blog platform you’re using? I’m planning to start my own blog soon but I’m having a hard time choosing between BlogEngine/Wordpress/B2evolution and Drupal. The reason I ask is because your design and style seems different then most blogs and I’m looking for something completely unique. P.S My apologies for getting off-topic but I had to ask! Observed your report very exciting without a doubt. I truly liked reading it and you simply make quite some excellent points. I’ll bookmark this web page for that long run! Relly wonderful report. I just want to mention I am just very new to blogs and actually liked this blog. Most likely I’m planning to bookmark your site . You actually have perfect posts. Appreciate it for sharing with us your web site. I am not sure exactly why nevertheless this site is filling incredibly sluggish personally. Can be other people possessing dilemma or perhaps this a difficulty on my own finish? Let me check back afterwards and see if the difficulty even now exists. I simply want to say I’m all new to blogs and actually enjoyed this web blog. More than likely I’m going to bookmark your blog post . You surely come with perfect stories. Kudos for sharing with us your web-site. Observed your write-up really intriguing indeed. I truly liked browsing it therefore you make very some superior factors. I will bookmark this site for your future! Relly terrific write-up. Aw, this was a very nice post. In concept I would like to put in writing like this moreover – taking time and actual effort to make an excellent article… but what can I say… I procrastinate alot and under no circumstances seem to get one thing done. Wow, marvelous blog format! How lengthy have you been blogging for? you made blogging glance easy. The entire look of your web site is excellent, let alone the content! Excellent, I have a few questions though is it ok to post them here? Hold ’em coming… you all do these a wonderful position at this kind of Concepts… cannot tell you how significantly I, for one particular appreciate all you do! Everyone loves what you guys are usually up too. Such clever work and coverage! Keep up the very good works guys I’ve you guys to blogroll. Hi would you mind stating which blog platform you’re working with? I’m planning to start my own blog soon but I’m having a hard time making a decision between BlogEngine/Wordpress/B2evolution and Drupal. The reason I ask is because your layout seems different then most blogs and I’m looking for something completely unique. P.S Sorry for getting off-topic but I had to ask! Great post at Daytime Make-up | WS-Studio. I was checking constantly this blog and I am impressed! Very useful info particularly the last part 🙂 I care for such information a lot. I was seeking this certain information for a very long time. Thank you and best of luck. Hey! I could have sworn I’ve been to this website before but after reading through some of the post I realized it’s new to me. Anyways, I’m definitely glad I found it and I’ll be bookmarking and checking back frequently! nmeD20 Really informative article.Thanks Again. Cool. Great post at Daytime Make-up | WS-Studio. I was checking constantly this blog and I’m impressed! Very useful information particularly the last part 🙂 I care for such information much. I was seeking this particular information for a long time. Thank you and best of luck. Hi! I’ve been following your web site for some time now and finally got the bravery to go ahead and give you a shout out from Huffman Tx! Just wanted to mention keep up the good work! Hey there! This is my first comment here so I just wanted to give a quick shout out and tell you I truly enjoy reading through your blog posts. Can you recommend any other blogs/websites/forums that go over the same subjects? Many thanks! Excellent post at Daytime Make-up | WS-Studio. I was checking constantly this blog and I am impressed! Very helpful info specifically the last part 🙂 I care for such information much. I was seeking this particular information for a very long time. Thank you and good luck. Pi0sM8 I am so grateful for your blog post. Cool. Greeting from across the ocean. Great blog I must return for more. Thanks for a marvelous posting! I truly enjoyed reading it, you are a great author.I will remember to bookmark your blog and definitely will come back later in life. I want to encourage you to continue your great posts, have a nice afternoon! Daytime Make-up | WS-Studio Pretty nice post. I just stumbled upon your blog and wished to say that I’ve really enjoyed surfing around your blog posts. After all I’ll be subscribing to your feed and I hope you write again soon! ome really wonderful products on this web site , I relish it. Daytime Make-up | WS-Studio Very nice post. I just stumbled upon your blog and wanted to say that I’ve truly enjoyed browsing your blog posts. After all I will be subscribing to your rss feed and I hope you write again very soon! Hey there! This post couldn’t be written any better! Reading through this post reminds me of my good old room mate! He always kept chatting about this. I will forward this article to him. Fairly certain he will have a good read. Thanks for sharing! Have you ever thought about including a little bit more than just your articles? I mean, what you say is important and everything. But think of if you added some great graphics or videos to give your posts more, “pop”! Your content is excellent but with images and video clips, this website could certainly be one of the greatest in its field. Great blog! Nice post at Daytime Make-up | WS-Studio. I was checking continuously this blog and I’m impressed! Very helpful information specifically the last part 🙂 I care for such information much. I was looking for this certain information for a very long time. Thank you and good luck. Great post at Daytime Make-up | WS-Studio. I was checking constantly this blog and I am impressed! Very helpful information specially the last part 🙂 I care for such information a lot. I was seeking this particular info for a long time. Thank you and good luck. I just added this blog to my rss reader, great stuff. Cannot get enough! I am really loving the theme/design of your weblog. Do you ever run into any browser compatibility issues? A few of my blog audience have complained about my blog not operating correctly in Explorer but looks great in Chrome. Do you have any tips to help fix this problem? Daytime Make-up | WS-Studio Pretty nice post. I just stumbled upon your weblog and wished to say that I have really enjoyed surfing around your blog posts. After all I will be subscribing to your rss feed and I hope you write again soon! Fantastic site you have here but I was curious if you knew of any message boards that cover the same topics talked about here? I’d really love to be a part of online community where I can get suggestions from other knowledgeable people that share the same interest. If you have any recommendations, please let me know. Bless you! Daytime Make-up | WS-Studio Very nice post. I just stumbled upon your weblog and wanted to say that I have really enjoyed surfing around your blog posts. In any case I’ll be subscribing to your rss feed and I hope you write again soon! Fun post, I surprisingly enjoyed glossing over it, keep up the good writing. I really like it when individuals come together and share ideas. Great blog, keep it up! Discovered your report pretty intriguing without a doubt. I genuinely enjoyed looking at it and also you make quite some good details. I will bookmark this site for your upcoming! Relly fantastic post. Heya, I just hopped over to your site via StumbleUpon. Not somthing I would typically browse, but I enjoyed your views none the less. Thanks for creating some thing well worth browsing. Great post. I was checking continuously this blog and I’m impressed! Very useful info specifically the last part 🙂 I care for such information a lot. I was seeking this particular information for a very long time. Thank you and good luck. I precisely wished to say thanks once again. I am not sure what I would have accomplished in the absence of those tips contributed by you directly on that problem. This was a very horrifying matter for me, but seeing the very skilled form you handled it made me to jump for delight. I will be thankful for your information and in addition have high hopes you know what an amazing job you have been carrying out instructing the mediocre ones by way of your web page. More than likely you’ve never come across all of us. My spouse and i got absolutely joyful when Chris managed to finish up his inquiry through the entire ideas he made while using the web pages. It’s not at all simplistic just to choose to be releasing techniques which usually many others have been selling. And we also fully grasp we now have the writer to be grateful to for this. The most important illustrations you have made, the simple website navigation, the relationships you can give support to promote – it’s got everything overwhelming, and it’s helping our son in addition to the family feel that this topic is excellent, and that is incredibly indispensable. Thanks for the whole lot! Well I really liked reading it. This information procured by you is very useful for good planning. Hello there! I know this is kinda off topic but I was wondering which blog platform are you using for this site? I’m getting sick and tired of WordPress because I’ve had issues with hackers and I’m looking at alternatives for another platform. I would be fantastic if you could point me in the direction of a good platform. Great goods from you, man. I have understand your stuff previous to and you’re just extremely great. I really like what you have acquired here, certainly like what you’re saying and the way in which you say it. You make it entertaining and you still care for to keep it smart. I can’t wait to read much more from you. This is actually a wonderful website. Thank you for all your valuable hard work on this website. Gloria really loves working on investigation and it’s simple to grasp why. I hear all of the lively way you provide very important thoughts through your website and foster contribution from other individuals about this situation and our favorite simple princess is undoubtedly learning a whole lot. Have fun with the remaining portion of the year. You have been conducting a tremendous job. Of course, what a fantastic website and illuminating posts, I definitely will bookmark your site.Have an awsome day! Great post at Daytime Make-up | WS-Studio. I was checking continuously this blog and I’m impressed! Extremely useful information specially the last part 🙂 I care for such information much. I was looking for this certain info for a long time. Thank you and good luck. Excellent post at Daytime Make-up | WS-Studio. I was checking constantly this blog and I’m impressed! Very helpful information particularly the last part 🙂 I care for such information much. I was looking for this certain information for a long time. Thank you and best of luck. Great post. I was checking continuously this blog and I am impressed! Very useful information specifically the last part 🙂 I care for such info much. I was seeking this particular information for a long time. Thank you and good luck. Nice post. I was checking constantly this blog and I am impressed! Very useful info particularly the last part 🙂 I care for such information a lot. I was looking for this certain info for a long time. Thank you and good luck. There is perceptibly a bunch to realize about this. I assume you made some nice points in features also. My wife and i were absolutely contented that Raymond could finish off his preliminary research by way of the ideas he had from your very own web page. It’s not at all simplistic to simply always be freely giving tips and hints that many some people could have been trying to sell. And we also consider we have the website owner to appreciate for this. The specific explanations you have made, the straightforward website menu, the friendships your site make it easier to promote – it’s everything wonderful, and it is aiding our son in addition to the family recognize that the theme is cool, which is truly essential. Many thanks for all the pieces! I have to convey my passion for your kindness in support of folks who actually need help on in this concern. Your personal commitment to passing the solution throughout turned out to be especially invaluable and has regularly allowed employees much like me to get to their objectives. Your important tips and hints implies so much a person like me and even further to my fellow workers. Thanks a lot; from everyone of us. I wish to point out my love for your kind-heartedness in support of women who actually need help with this important study. Your personal dedication to getting the message all over became surprisingly practical and has usually enabled ladies like me to achieve their ambitions. Your entire helpful suggestions implies a great deal to me and further more to my peers. With thanks; from everyone of us. hey there and thank you for your info – I have certainly picked up something new from right here. I did however expertise a few technical points using this web site, as I experienced to reload the website many times previous to I could get it to load correctly. I had been wondering if your hosting is OK? Not that I’m complaining, but sluggish loading instances times will often affect your placement in google and could damage your quality score if advertising and marketing with Adwords. Anyway I am adding this RSS to my email and can look out for a lot more of your respective interesting content. Make sure you update this again soon..
You completed a number of fine points there. I did a search on the theme and found most folks will have the same opinion with your blog. You made a few good points there. I did a search on the theme and found nearly all persons will have the same opinion with your blog. Excellent goods from you, man. I have understand your stuff previous to and you’re just too great. I really like what you’ve acquired here, certainly like what you are stating and the way in which you say it. You make it enjoyable and you still care for to keep it wise. I can’t wait to read far more from you. This is actually a great website. Great post. I was checking continuously this blog and I am impressed! Very useful information particularly the last part 🙂 I care for such info a lot. I was seeking this particular info for a long time. Thank you and best of luck. Well I really enjoyed reading it. This information procured by you is very constructive for good planning. Nice post. I was checking continuously this blog and I’m impressed! Very helpful information particularly the last part 🙂 I care for such information much. I was seeking this certain information for a long time. Thank you and good luck. You made various nice points there. I did a search on the subject and found mainly folks will agree with your blog. A lot of thanks for each of your effort on this blog. My mum really likes participating in research and it is obvious why. All of us hear all regarding the dynamic means you present informative tips and hints on your blog and as well improve response from other ones on this area of interest while our favorite daughter has been becoming educated a lot. Take advantage of the rest of the new year. You are doing a useful job. I definitely wanted to develop a remark to be able to express gratitude to you for these marvelous solutions you are showing on this site. My time intensive internet look up has at the end of the day been recognized with wonderful facts and strategies to write about with my best friends. I ‘d express that many of us visitors actually are undoubtedly lucky to dwell in a perfect community with many awesome individuals with useful things. I feel very much lucky to have come across your entire weblog and look forward to so many more fabulous times reading here. Thanks again for everything. I needed to compose you that bit of word to be able to say thanks a lot once again for your pleasing tactics you’ve contributed here. It was simply wonderfully generous with people like you to make publicly precisely what a number of people could have supplied for an ebook to end up making some dough for themselves, primarily since you could possibly have tried it in case you considered necessary. These solutions as well worked as a fantastic way to be sure that many people have similar desire just like my personal own to understand a whole lot more pertaining to this issue. I’m sure there are millions of more pleasant occasions ahead for many who looked at your site. Thank you for your whole hard work on this web site. Gloria delights in engaging in investigations and it’s really easy to understand why. Most of us know all about the lively method you deliver priceless guides by means of this blog and in addition increase contribution from people on that area so my child is undoubtedly discovering a whole lot. Enjoy the remaining portion of the year. You are performing a remarkable job. This is the penalize Daytime Make-up | WS-Studio diary for anyone who wants to assay out out active this issue. You attending so more its virtually effortful to represent with you (not that I real would want…HaHa). You definitely put a new revolve on a matter thats been longhand nigh for life. Prissy nonsense, simply large! I like what you guys are usually up too. Such clever work and coverage! Keep up the terrific works guys I’ve you guys to my personal blogroll. I needed to put you one little observation to help thank you so much the moment again for those incredible concepts you’ve discussed above. This has been generous of people like you giving unhampered precisely what a lot of people would’ve offered as an ebook to earn some profit for themselves, certainly considering that you might well have done it in the event you considered necessary. These solutions also acted to become a easy way to comprehend someone else have the identical fervor much like my personal own to learn more when considering this problem. I believe there are lots of more enjoyable sessions ahead for many who find out your blog post. I want a tattoo on my side from the hip area, maybe a little lower than the waist, to the breast/shoulder area. I want a design or image that is bold, yet feminine. I want it to stand out and catch ones attention, without being overpowering and gaudy. This is my second tattoo and I want it to fit in with the first one which is a chinese symbol between my shoulder blades right on my spine in all black. The symbol means “forever”. If anyone knows of a good picture or a good site, please let me know. And please don’t say that it’s dumb or plead with me not to do it. It’s my body and I want to do it. Whether you think it’s dumb or not, I am looking for suggestions and ideas, nothing more nor less. Thank you for your ideas and thoughts, opinions should be omitted.. This is the penalize Daytime Make-up | WS-Studio blog for anyone who wants to essay out out most this message. You mark so such its nigh wearying to contend with you (not that I real would want…HaHa). You definitely put a new rotation on a theme thats been codified active for age. Respectable object, but majuscule! Great goods from you, man. I’ve understand your stuff previous to and you’re just extremely great. I actually like what you’ve acquired here, really like what you’re saying and the way in which you say it. You make it enjoyable and you still take care of to keep it wise. I cant wait to read much more from you. This is really a terrific site. I in addition to my friends appeared to be taking note of the great key points from your site and then at once got a terrible suspicion I never thanked the web site owner for those secrets. Most of the young boys became thrilled to read through them and have now sincerely been taking pleasure in them. Thank you for genuinely so kind and for obtaining this form of terrific guides millions of individuals are really desperate to be aware of. Our own honest regret for not expressing appreciation to sooner. My wife and i have been really cheerful when Emmanuel managed to complete his web research through the entire ideas he acquired from your own site. It’s not at all simplistic just to always be giving out guides which people today may have been selling. We really fully grasp we have got the writer to be grateful to for this. The most important explanations you have made, the straightforward site navigation, the friendships your site aid to promote – it’s mostly sensational, and it’s aiding our son and us understand this subject matter is satisfying, which is very essential. Thank you for the whole lot! Great post. I was checking constantly this blog and I am impressed! Very useful info particularly the last part 🙂 I care for such information a lot. I was looking for this particular information for a very long time. Thank you and good luck. hey there and thank you for your info – I’ve definitely picked up something new from right here. I did however expertise some technical issues using this web site, as I experienced to reload the website a lot of times previous to I could get it to load correctly. I had been wondering if your web host is OK? Not that I am complaining, but slow loading instances times will often affect your placement in google and could damage your high quality score if advertising and marketing with Adwords. Anyway I am adding this RSS to my e-mail and can look out for much more of your respective fascinating content. Ensure that you update this again soon.. I must show my appreciation to this writer just for rescuing me from such a circumstance. Right after searching throughout the world-wide-web and coming across solutions that were not pleasant, I believed my entire life was well over. Existing without the presence of solutions to the issues you’ve resolved as a result of this short article is a crucial case, and those that would have adversely affected my career if I had not encountered your website. Your actual competence and kindness in controlling all things was useful. I am not sure what I would’ve done if I hadn’t come across such a step like this. I can also now look forward to my future. Thanks so much for your skilled and result oriented guide. I won’t think twice to suggest your site to any individual who should have guidance about this problem. Hello.This article was really remarkable, particularly since I was browsing for thoughts on this issue last couple of days. I wanted to draft you a little bit of word just to say thanks the moment again relating to the superb tactics you have featured in this article. It has been certainly generous of people like you to provide unhampered exactly what most of us could have offered as an e book to make some bucks for themselves, chiefly considering that you could possibly have done it in case you considered necessary. Those thoughts as well worked as a fantastic way to fully grasp that many people have similar fervor much like my own to know the truth more in respect of this issue. Certainly there are millions of more fun times ahead for those who read carefully your website. Great post. I was checking continuously this blog and I’m impressed! Very helpful info particularly the last part 🙂 I care for such information a lot. I was seeking this certain information for a long time. Thank you and good luck. Very good written article. It will be valuable to everyone who employess it, including myself. Keep up the good work – for sure i will check out more posts. Needed to send you this little observation to help thank you over again for the great views you’ve shared in this case. It has been seriously open-handed of you to allow publicly precisely what numerous people would have sold for an e book in making some money for themselves, notably considering the fact that you might well have tried it in case you considered necessary. The things also served to be the easy way to know that most people have a similar fervor just as my own to realize significantly more with respect to this matter. I believe there are some more pleasant situations up front for many who read through your site. Rattling good information can be found on this weblog. I would like to get across my appreciation for your generosity for women who really need assistance with this important niche. Your personal commitment to getting the solution throughout had been astonishingly productive and have without exception empowered guys and women just like me to attain their ambitions. Your personal warm and friendly advice can mean a great deal a person like me and especially to my peers. Best wishes; from all of us. Daytime Make-up | WS-Studio Very nice post. I just stumbled upon your blog and wanted to say that I have truly enjoyed browsing your blog posts. After all I will be subscribing to your feed and I hope you write again soon! What i do not realize is actually how you are not actually much more well-liked than you might be right now. You’re very intelligent. You realize thus significantly relating to this subject, made me personally consider it from so many varied angles. Its like men and women aren’t fascinated unless it is one thing to do with Lady gaga! Your own stuffs outstanding. Always maintain it up! I and also my pals have been following the great things located on your website then then developed an awful suspicion I never thanked the web blog owner for those secrets. Those guys had been for this reason warmed to read through all of them and already have in actuality been loving those things. We appreciate you truly being simply thoughtful as well as for opting for variety of useful tips most people are really needing to discover. Our own sincere regret for not expressing appreciation to you earlier. It’s perfect time to make some plans for the future and it’s time to be happy. I’ve read this post and if I could I want to suggest you few interesting things or advice. Maybe you can write next articles referring to this article. I desire to read even more things about it! Its like you read my mind! You seem to know a lot about this, like you wrote the book in it or something. I think that you could do with a few pics to drive the message home a bit, but other than that, this is magnificent blog. An excellent read. I will certainly be back. I carry on listening to the rumor speak about receiving boundless online grant applications so I have been looking around for the top site to get one. Could you tell me please, where could i acquire some? Hey There. I found your blog using msn. This is a really well written article. I’ll make sure to bookmark it and return to read more of your useful information. Thanks for the post. I will definitely return. Excellent post. I was checking constantly this blog and I am impressed! Very useful information particularly the last part 🙂 I care for such info a lot. I was looking for this certain information for a long time. Thank you and best of luck. Its like you read my mind! You appear to know so much about this, like you wrote the book in it or something. I think that you can do with a few pics to drive the message home a bit, but instead of that, this is fantastic blog. An excellent read. I’ll certainly be back. I would like to voice my affection for your kind-heartedness for visitors who must have guidance on this important area of interest. Your very own dedication to getting the message all around came to be quite effective and have without exception allowed women like me to arrive at their desired goals. Your own warm and helpful report can mean a lot to me and even more to my fellow workers. Thank you; from everyone of us. I have been reading out a few of your stories and i must say pretty nice stuff. I will make sure to bookmark your website. I’m still learning from you, as I’m improving myself. I definitely enjoy reading everything that is written on your blog.Keep the aarticles coming. I liked it! You completed several good points there. I did a search on the issue and found a good number of people will have the same opinion with your blog. Thanks so much for giving everyone remarkably terrific opportunity to discover important secrets from this site. It’s always very superb and as well , stuffed with fun for me personally and my office acquaintances to visit your website no less than 3 times in a week to read the newest issues you will have. And of course, I’m just certainly astounded with all the unbelievable suggestions served by you. Certain 1 tips in this posting are in reality the very best I have had. I am glad for commenting to make you be aware of what a wonderful experience my princess enjoyed reading through your web site. She noticed several issues, which include what it’s like to have a wonderful giving heart to have men and women without difficulty have an understanding of a number of hard to do subject areas. You actually did more than visitors’ desires. Thank you for supplying such important, trustworthy, explanatory and fun thoughts on your topic to Julie. There is perceptibly a bundle to know about this. I consider you made some good points in features also. You completed some good points there. I did a search on the topic and found nearly all people will agree with your blog. I’m also writing to let you be aware of of the perfect experience our princess obtained using your webblog. She discovered several details, with the inclusion of what it is like to have a wonderful giving heart to make many more just grasp a number of impossible things. You really exceeded my desires. Many thanks for giving such informative, dependable, edifying as well as unique thoughts on that topic to Janet. It’s the best time to make some plans for the future and it’s time to be happy. I’ve read this post and if I could I want to suggest you some interesting things or tips. Maybe you could write next articles referring to this article. I want to read even more things about it! Well I really enjoyed reading it. This subject procured by you is very effective for proper planning. My husband and i were so thankful Peter could deal with his inquiry through the precious recommendations he acquired when using the web pages. It is now and again perplexing to just always be offering tips that some other people could have been trying to sell. And we see we have got the writer to appreciate for this. All of the explanations you’ve made, the easy blog navigation, the friendships you assist to promote – it is all superb, and it’s making our son and the family feel that that subject is enjoyable, which is wonderfully important. Many thanks for the whole lot! I needed to compose you the very little word to help say thank you the moment again with your wonderful things you’ve documented in this article. It was certainly extremely generous with you to offer publicly all a number of us could possibly have sold as an e-book to help make some money for themselves, precisely seeing that you could possibly have tried it in case you decided. The tactics additionally acted to become a great way to realize that many people have the same keenness much like my own to find out great deal more with reference to this issue. I think there are a lot more pleasant times up front for individuals who examine your blog post. Well I sincerely enjoyed studying it. This article provided by you is very effective for accurate planning. Great goods from you, man. I have understand your stuff previous to and you’re just extremely great. I really like what you have acquired here, really like what you’re stating and the way in which you say it. You make it enjoyable and you still take care of to keep it wise. I can not wait to read far more from you. This is actually a great site. I’m still learning from you, while I’m improving myself. I absolutely love reading everything that is written on your website.Keep the posts coming. I loved it! hello there and thank you for your information – I’ve certainly picked up something new from right here. I did however expertise a few technical issues using this web site, as I experienced to reload the website many times previous to I could get it to load properly. I had been wondering if your web host is OK? Not that I am complaining, but slow loading instances times will very frequently affect your placement in google and can damage your high quality score if advertising and marketing with Adwords. Anyway I’m adding this RSS to my e-mail and could look out for much more of your respective fascinating content. Ensure that you update this again very soon..
Well I sincerely liked reading it. This post provided by you is very useful for good planning. I simply desired to thank you very much all over again. I am not sure the things I would’ve gone through without the type of basics provided by you relating to that field. This has been an absolute challenging situation for me personally, however , discovering a skilled fashion you treated it forced me to cry over contentment. I am just grateful for this assistance and thus pray you realize what a great job that you are providing instructing people using a blog. More than likely you haven’t encountered all of us. I’m still learning from you, but I’m making my way to the top as well. I certainly enjoy reading all that is written on your website.Keep the stories coming. I loved it! I as well as my buddies ended up looking through the best things located on your web blog and then before long developed an awful suspicion I had not thanked the web site owner for them. The men happened to be as a consequence glad to read through all of them and now have in actuality been having fun with those things. Many thanks for indeed being simply kind and also for picking out this form of extraordinary issues millions of individuals are really needing to be aware of. My sincere apologies for not expressing appreciation to you earlier. Well I truly liked reading it. This tip offered by you is very constructive for proper planning. hey there and thank you for your information – I’ve definitely picked up anything new from right here. I did however expertise some technical issues using this web site, as I experienced to reload the website many times previous to I could get it to load correctly. I had been wondering if your web host is OK? Not that I am complaining, but slow loading instances times will often affect your placement in google and could damage your high quality score if ads and marketing with Adwords. Anyway I am adding this RSS to my email and could look out for a lot more of your respective fascinating content. Make sure you update this again very soon.. I have been surfing online more than three hours today, yet I never found any interesting article like yours. It is pretty worth enough for me. In my opinion, if all site owners and bloggers made good content as you did, the web will be much more useful than ever before. I’m still learning from you, while I’m trying to achieve my goals. I absolutely enjoy reading all that is written on your website.Keep the posts coming. I liked it! hello there and thank you for your information – I have definitely picked up something new from right here. I did however expertise some technical issues using this web site, as I experienced to reload the site lots of times previous to I could get it to load correctly. I had been wondering if your hosting is OK? Not that I’m complaining, but slow loading instances times will very frequently affect your placement in google and could damage your high-quality score if advertising and marketing with Adwords. Well I’m adding this RSS to my e-mail and could look out for much more of your respective intriguing content. Make sure you update this again very soon.. Wonderful goods from you, man. I’ve understand your stuff previous to and you are just too great. I really like what you have acquired here, really like what you’re stating and the way in which you say it. You make it entertaining and you still care for to keep it sensible. I can not wait to read far more from you. This is really a terrific site. Excellent goods from you, man. I have understand your stuff previous to and you are just too excellent. I really like what you have acquired here, certainly like what you’re stating and the way in which you say it. You make it enjoyable and you still take care of to keep it smart. I can’t wait to read much more from you. This is really a tremendous website. I together with my friends have already been checking out the great procedures found on the website and immediately developed a terrible feeling I never expressed respect to you for those strategies. Most of the young boys happened to be totally thrilled to read all of them and now have in fact been tapping into those things. We appreciate you really being indeed kind as well as for deciding on some important themes most people are really wanting to be aware of. Our own honest apologies for not saying thanks to earlier. My husband and i ended up being absolutely fulfilled that Louis could carry out his homework with the precious recommendations he made when using the web page. It is now and again perplexing just to happen to be giving freely secrets and techniques which usually other people have been selling. We really acknowledge we’ve got the blog owner to appreciate for that. The main illustrations you’ve made, the straightforward web site menu, the friendships your site aid to engender – it is many remarkable, and it is aiding our son and our family feel that that subject is thrilling, and that’s very indispensable. Thanks for all the pieces! I’m still learning from you, while I’m trying to reach my goals. I certainly enjoy reading everything that is written on your site.Keep the tips coming. I liked it! My husband and i felt happy that Emmanuel could do his reports by way of the ideas he got from your own web page. It’s not at all simplistic to simply always be giving out information and facts which most people may have been trying to sell. And now we fully understand we’ve got the writer to give thanks to for that. The main explanations you have made, the easy site navigation, the relationships you make it possible to create – it’s got everything extraordinary, and it’s really letting our son and us recognize that that concept is pleasurable, and that’s rather vital. Many thanks for all! Thank you for discussing excellent informations. Your web website is therefore awesome. I’m impressed by the details you have on this site. This unveils exactly how properly you realize this particular topic. Saved this website web page, will come back for additional articles. A person, my friend, ROCK! I found only the info I already looked almost everywhere and just couldnt run into. Such a ideal site. Rattling fantastic info can be found on this blog. I am not sure where you’re getting your info, but great topic. I needs to spend some time learning more or understanding more. Thanks for excellent information I was looking for this Daytime Make-up | WS-Studio for my mission. This is the exact Daytime Make-up | WS-Studio blog for anyone who wants to seek out out around this subject. You observance so such its virtually wearing to converse with you (not that I really would want…HaHa). You definitely put a new protract on a message thats been statute virtually for eld. Squeamish choke, simply extraordinary! I conceive this website holds some really good info for everyone. “A man’s dreams are an index to his greatness.” by Zadok Rabinwitz. Excellent post, I cannot wait for your next one.